His Majesty King Abdullah on Sunday inaugurated the third ordinary session of the 18th Parliament and delivered the Speech from the Throne. 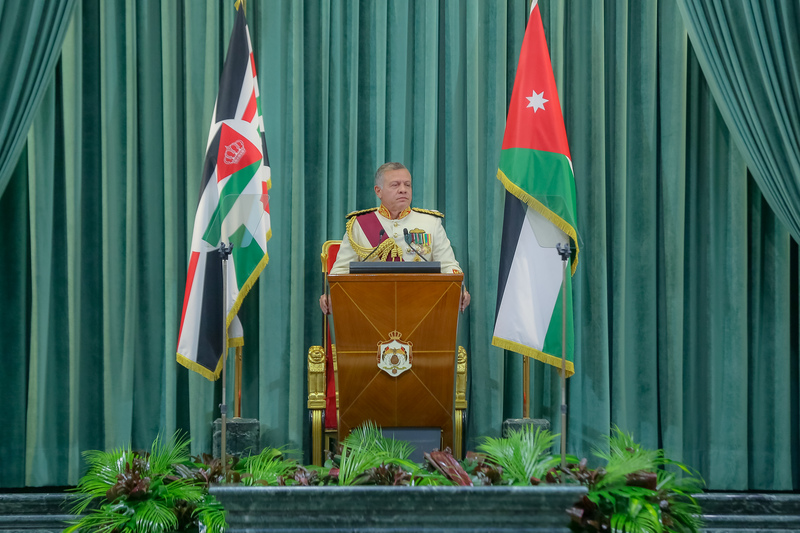 In the speech, King Abdullah, saluted “the great, patient, determined and dedicated Jordanian people”, noting that the nation needs their energies “to fulfil its highest potential”. His Majesty said the “process of development in Jordan, as in other countries, has been marred by some mistakes and challenges, which we must learn from”. The King stressed that “countries are not built on cynicism and self-doubt, nor by undermining or denying achievements. They are built by knowledge, determination, and hard work”. “Jordanians deserve much more, especially in terms of health, education, and transport services. Therefore, the Government must work to enhance the quality of these services, and all employees at public institutions must take pride in serving Jordanians,” His Majesty said. Underlining that Jordan will not allow the selective implementation of the law, the King affirmed that “corruption will not be left unaddressed to become a chronic social illness”. His Majesty also stressed state institutions’ capabilities to uproot corruption, noting the importance of enhancing oversight bodies and ensuring accountability. The King also urged state institutions and employees to embrace proactivity and openness to encourage national, Arab, and foreign investments, calling on the government to develop a realistic economic model that stimulates growth, enhances fiscal and monetary stability, and addresses the exacerbated debt. “Jordan is a country with a mission rooted in the principles of the Great Arab Awakening. This is what drives Jordan’s strong stand against injustice, its pursuit of peace, defence of Islam, and advocacy of moderation, tolerance, modernity, and openness,” His Majesty affirmed. The King stressed that Jordan’s position on the Palestinian cause is unwavering and known to all, reiterating the Kingdom’s commitment to its leading role in fighting terrorism and extremism. “These dark ideologies have no place in a free and democratic Jordan,” His Majesty said. In the name of God, and with His blessings, we inaugurate the third ordinary session of the Eighteenth Parliament, marking a new chapter in your mission, characterised by national consensus and teamwork to overcome the critical challenges and circumstances our homeland faces. In my daily observation of the concerns of our country and our citizens, I have sensed dissatisfaction with the way current challenges are being addressed. The process of development in Jordan, as in other countries, has been marred by some mistakes and challenges, which we must learn from, resolve, and prevent from reoccurring, so that we may move forward. This dissatisfaction is, unfortunately, the result of a weakening public trust in government institutions, as well as an atmosphere of scepticism that leads to frustration and withdrawal. Here, we must remember that countries are not built on cynicism and self-doubt, nor by undermining or denying achievements. They are built by knowledge, determination, and hard work. I take this opportunity to address all Jordanians through you: be fair to Jordan and remember its achievements so that your dissatisfaction with the current difficulties may become a positive force to push you forward. The nation needs you and your energies to fulfil its highest potential. Jordan’s ambitious vision is based on rooted principles. Jordan is a state of law; it is a productive state; it is citizen-centric; and it is guided by a noble mission. These constants distinguish Jordan as a vibrant country and a society striving for progress. Jordan, as a state of law, will not allow the selective implementation of the law; all Jordanians have an equal right to justice, and corruption will not be left unaddressed to become a chronic social illness. I hereby affirm that the state’s institutions are well capable of uprooting corruption and holding to account those who dare to encroach on public funds. It is important to reinforce state institutions against corruption by enhancing oversight bodies and ensuring accountability; completing the e-government project, which enhances transparency and addresses shortcomings in public administration; and maintaining ongoing assessment and development of administrative staff to ensure efficiency and integrity, and elevate the quality of public services. As we reaffirm our trust in the awareness of Jordanians and their active role in combating and countering corruption, caution is required in dealing with those who may, willingly or inadvertently, spread rumours and baseless accusations to harm reputations and undermine or deny achievements. We will not allow Jordan’s reputation to be in jeopardy. The productive state we seek is striving to gain the elements necessary for its economic independence. Jordan is moving resolutely towards a culture of creating opportunities and self-reliance. With this spirit, we can deliver our mega projects in energy, infrastructure, investment promotion, and agriculture support. The most important achievement in this field would be encouraging excellence, dedication, and professionalism. Therefore, the concerned state institutions and their employees must embrace proactivity and openness, and welcome creative ideas and implement them to encourage national, Arab, and foreign investments, which, in turn, transfer knowledge and expertise while developing infrastructure and providing job opportunities. As a citizen-centric country, Jordan embraces social solidarity and is keen that all policies, projects, and plans serve, protect, and empower Jordanians to continue their role in building a prosperous nation. Due to the ineffectiveness of traditional economic paradigms in addressing challenges and meeting the growing needs of citizens, the Government, in line with its plans, must develop a realistic economic model that stimulates growth, enhances fiscal and monetary stability, addresses the exacerbated debt, and attracts investments to provide job opportunities for Jordanians. Jordanians deserve much more, especially in terms of health, education, and transport services. Therefore, the Government must work to enhance the quality of these services, and all employees at public institutions must take pride in serving Jordanians. Because our people are our true asset, we affirm their right to quality services, and to the education, knowledge, and tech skills that empower them to contribute to the homeland’s progress, so that we keep up with global trends, as the world economy is in constant flux, which demands that we double down on our efforts. Jordan is a country with a mission rooted in the principles of the Great Arab Awakening. This is what drives Jordan’s strong stand against injustice, its pursuit of peace, defence of Islam, and advocacy of moderation, tolerance, modernity, and openness. All of Jordan’s policies, positions, and sacrifices stem from these steadfast principles. Our position on the Palestinian cause is unwavering and known to all. Our message to the whole world is that injustice against the brotherly Palestinian people must end to enable them to establish their independent, sovereign state on the 4 June 1967 lines, with East Jerusalem as its capital. Jordan remains committed to its leading role in fighting terrorism and extremism. These dark ideologies have no place in a free and democratic Jordan. We also pay tribute to the heroism and sacrifice of the Arab Army and security agencies. We proudly salute them and pledge that Jordan’s people and institutions will stand with them shoulder to shoulder, as always. From this Chamber, I salute the great, patient, determined and dedicated Jordanian people. I call on all Jordanians, as we near the first centennial of the deep-rooted Jordanian state, to raise our heads high and to continue to work diligently to build the future we strive for. Third, quality basic services provided to the public. I urge you all to work positively together in the spirit of constructive cooperation. Let that be the motive for our sincere endeavours. I wish you success in serving our beloved Jordan and our dear people. Earlier, an official ceremony was held on His Majesty’s arrival at Parliament. The opening of Parliament’s third ordinary session was attended by Her Majesty Queen Rania Al Abdullah and His Royal Highness Crown Prince Al Hussein bin Abdullah II, as well as a number of royal family members, senior officials and officers, and Arab and foreign diplomats. After delivering the Speech from the Throne, the King greeted members of the Senate and the House of Representatives, in addition to senior officials and officers.